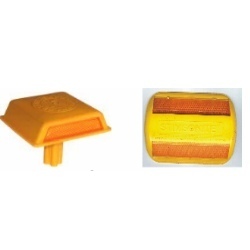 We, being a SSI unit with ISO 9001:2000 certifications, are engaged in manufacturing, supplying a wide array of Road Reflectors. These products are widely demanded for high luminosity, visibility and clarity. Our clients can avail from us an unmatched quality range of Raised Pavement Markers. These are manufactured with cube corner or prismatic technology and are available in various sizes, specifications and designs in the market. Our products are used for different applications and are available in customized specifications in the market. We offer these markers at very affordable prices to our valuable clients and these are available in a reliable manner.